High-powered motorcycle manufacturer Ducati opened its assembly line at the Amata industrial estate Nov 7. 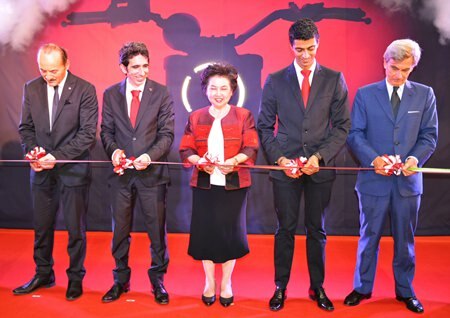 The managing director of Ducati Motor Thailand, Francesco Milicia, welcomed Industry Ministry Permanent Secretary Atchaka Sibunruang and Italian Ambassador Francesco Saverio Nisio to the event, along with Ducati Italy board member Silvano Fini and Amata President Vibbon Kromadit. The guests congratulated Ducati on its start in Thailand and expressed their gratitude about the good relations between Italy and Thailand. The managing director said that he and all the board members in Italy were very happy to have opened in Thailand Ducati’s first-ever plant in a foreign country. VIP members cut the ribbon (L to R) Silvano Fini, Production Director of Ducati Motor Thailand; Francesco Milicia, Managing Director of Ducati Motor Thailand; Atchaka Sibunruang, Permanent Secretary of the Ministry of Industry; Pierfrancesco Scalzo, Manager of Sales & Marketing of Ducati Motor Thailand; and Francesco Nisio, Italian Ambassador to Thailand on the official opening day of Ducati Motor Thailand in Amata City, Rayong. Following speeches, guests cut the opening ribbon and toured the plant. Technique freaks could see close up the precision bikes are assembled. At the moment, the production is not running at full capacity, as only 4,500 bikes will be produced here this year. In 2015, that number should double. The manufacturer has opened an official showroom in Pattaya. After lunch, prepared by the Italian chef of the Centara Grand Mirage Beach Resort Pattaya Alberto Bruni, guests got down to talking business and shop. Ducati employees show how they produce a Ducati Motorbike.